This is Piedmont’s great white wine varietal, made from a very rare vine - Arneis which is grown to the left of the River Tanaro . Here the sandy soil of the hills of the Roero give it intense, rich aromas, while the limestone and clay provide structure and substance. 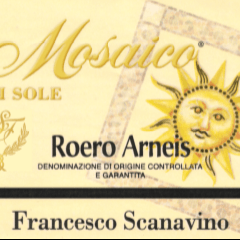 MOSAICO DI SOLE Piedmont white wine is widely appreciated for its elegance, which starts out in its straw yellow colour, continues through a nose of flowers and fresh fruit, and is brought to a consummate conclusion in the mouth, round and appealing, with a delicately bitterish aftertaste that cleans the palate in an invitation to have another taste.